 The vegetables in this soup are made with a vegetable spiralizer. (photo courtesy Wholesomeness.au). Turkey necks ([photo courtesy Oma’s Pride). THE NIBBLE first created its Daily Food Holiday Calendar in 2004. But it’s taken us this long to address one of the more unusual holidays: National Turkey Neck Soup Day, March 30th. Who established a holiday for turkey neck soup? And do you need more than one turkey neck? We couldn’t find an answer to who, but it turns out that turkey neck soup is a more economical way to feed a family than, say chicken or turkey soup made with the main parts of the poultry. And yes, you do need more than one turkey neck. Some people freeze the necks from the giblets bags that come in whole turkeys and chickens, until they have enough. You can buy turkey necks in the poultry department of supermarkets from Perdue and Shady Brook Farms, along with non-branded packages. Turkey necks themselves are bony, but they do have meat; and thus can be used to make that Paleo diet darling, bone broth. 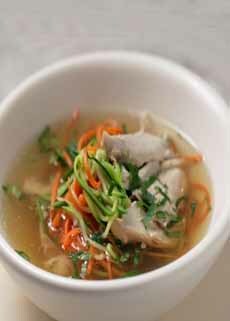 Want to make turkey neck soup? The classic, economical recipe combines turkey necks with root vegetables—carrots, parsnips, rutabaga, turnips—plus onion, celery and parsley. Potatoes, noodles or rice can bulk up the recipe. Here’s a recipe. A variation, this recipe uses two pounds of turkey necks, with the more elegant leeks and mushrooms as the main vegetables, plus a carrot and onion. It employs a mix of brown rice and wild rice to create a heartier meal soup. Some recipes called “turkey neck soup” start with the entire carcass from a roast turkey dinner. The neck from the giblets bag is usually available to toss in; and perhaps the other giblets, if they didn’t go into the gravy. However, if a so-called turkey neck soup has a good portion of turkey meat, then it’s regular turkey soup. If cooks have all that meat at hand, they don’t need to focus on the neck. For the first time in 13 years, we bid you a Happy National Turkey Neck Soup Day.